A new book on left-wing artists in Britain argues that money and modernism has consigned a generation of radical realists to obscurity. 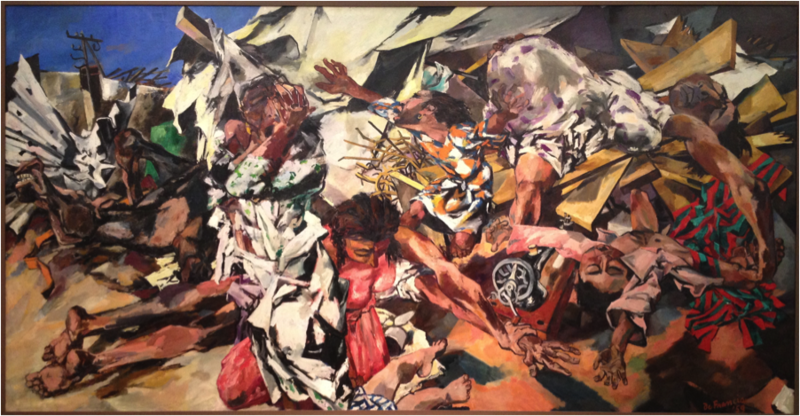 Peter de Francia, The Bombing of Sakiet (1959). The bronze bust of Karl Marx on a granite plinth above his tomb (and that of three other Marxes and the family housekeeper), was unveiled in 1956. Its unsigned sculptor was Laurence Bradshaw, whose grandfather had been a Chartist and whose mother was the first Labour councillor in Liverpool. Bradshaw enlisted during the First World War but later went to prison as a conscientious objector; after the war, he was an assistant to the painter and illustrator Frank Brangwyn, who had worked for William Morris. Yet, despite an excellent pedigree in both the labour and Arts and Crafts movements, Bradshaw is hardly a household name. The further you get into Art for All: British Socially Committed Art from the 1930s to the Cold War, Christine Lindey’s survey of artists like Bradshaw, who rarely make it into histories of modern British art, the more inevitable and irritating the general obscurity of most of her subjects begins to feel. It is well worth thinking why these artists are such marginal figures; the answers to this say as much about the failures and fractures of the British left as they do about how canons are formed and who gets to form them. Lindey prefers to call the art under discussion ‘socially committed’ rather than ‘socialist’ (too focused on subject matter) or ‘socially conscious’ (too wishy-washy in intention). Visual artists who had ‘an active engagement with social change’ in the 1930s often belonged to the Communist Party or the Artists’ International Association (and often both). The AIA was founded in 1933, and core members included Clifford Rowe and Pearl Binder, who had both spent 18 months working in the USSR as illustrators, along with Misha Black and the three Jameses – Fitton, Holland and Boswell. Lindey arranges her material into three periods: 1914 to 1939, the Second World War, and the postwar period until 1962. Each of these surveys of what artists were up to is accompanied by the most valuable part of Lindey’s research – a section on how these artists made a living and what kind of patronage, if any, was available to them. Lindey is particularly good on the biases of the education system and art world, which meant that those who were lucky enough to get scholarships to secondary school and then art school were often steered away from fine art in the first place – on the basis that they had to make a living. Teaching was an option for some – but not for women, and it didn’t pay out of term time. James Boswell gave up painting in 1932 to concentrate on illustration work and cartooning and joined the publicity department of Shell in 1936 to support his family. James Fitton, the son of millworkers in Oldham, took art classes mostly in the evening. The multi-talented Pearl Binder, whose father was a Russian-Jewish tailor in Salford, made the thoroughly sensible move of marrying well (twice). The influence of the AIA artists was at its peak during the war: the exhibitions it put on in Charing Cross tube station and in the ruins of the bombed John Lewis store on Oxford Street were notable successes. When Lindey describes how certain wartime scenes were frowned upon, it’s important to remember that artists needed to have a permit to draw or sketch in public places: Carel Weight was encouraged to paint zebras escaping London Zoo, instead of trolley bus passengers killed by an aerial bomb; Henry Moore’s serene, sleeping tube dwellers don’t betray any signs of the panicky effort it took to secure their places. The post-war period is something of a blur. We move from the co-option of the Arts Council by Establishment grandees to the AIA’s internal troubles, the decline of the Communist Party after 1956, and the failure of the trade unions – with a few honourable exceptions – to step in as patrons. The latter is less surprising given that a highlight of the book – or a low point for artist-trade union relations – is the account of a meeting between Arnold Wesker (in search of funding) and Frank Cousins, in which the playwright turned up half an hour late, with a female companion, and two puppies under his arm, one of which peed on the TGWU boss’s desk. When you add in a summary of the rise of Abstract Expressionism – the CIA’s most favoured art movement – and the effect it had on all realists (socially committed or not), there’s just too much ground to cover. In his very short book The Artist’s Dilemma (1947), James Boswell tacitly wrestled with the decision to step back from commercial work and turn to painting again (he let his membership of the Communist Party lapse at around the same time, saying ‘I am just no good as a “party man”’), looking forward to a world that hadn’t yet arrived: ‘It is the artist’s responsibility to demand the right to paint for the community. It is the community’s responsibility to […] make it possible for the artist to paint and to carve those dreams and visions which enrich the present and predict the future.’ Boswell wasn’t writing a goodbye to all that, but asking for a new and better kind of patronage. In 1964 – just out of the timeline of this book – he would design election posters for the Labour Party. Fatema Ahmed is deputy editor of Apollo Magazine.